Militants also seize Christians from Nigeria, Ghana. ISTANBUL, Turkey (Morning Star News) – As unconfirmed reports and rumors about the status of three Christians kidnapped in Libya by the Islamic State (IS) continue to spread in Egyptian media, a Coptic family waits in fear over the fate of their loved one. On Friday (July 17), an IS affiliate in Libya known as Islamic State, Barqa Province, announced that it had kidnapped three men, all of them Christians. 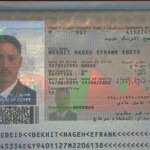 As evidence of their claims, they released photographs of the three men and photographs of their passport cover pages. 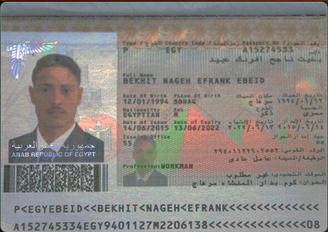 Bakhit Nageh Efrank Ebeid, 21, was traveling on July 10 in a 14-seat van from Alexandria, Egypt to Tripoli with a group of men, most of them Muslims from his hometown of Kom Badar, when IS militants stopped them in Sirte, Libya, according to Ezz Tawfik, a Coptic activist and journalist in Upper Egypt. Two other Christians, Adeola Ibrahim from Nigeria and Sekyere Kofi Frimpong from Ghana, were also in the van. The other two Christians were also taken captive. Later that day, some of those who were released called members of Ebeid’s family, who live in Tripoli, and reported the kidnapping. “His relatives didn’t know what to do, especially because his mother is sick, and such news might kill her, so they didn’t tell his family in Egypt,” Tawfik said. After IS announced the kidnapping, the family in Egypt became aware of the truth. Relatives decided to call Ebeid’s cell phone, but to their horror, an IS militant told them that they had beheaded the “infidel.” But in a subsequent call, the militants changed their story and told the family that Ebeid had to pay the Jizya tax on non-Muslims as ransom, or convert to Islam or be killed. When his family said they would pay the Jizya and asked how much it would be, they were told an amount was being decided, and then the phone connection went dead, according to family members. Despite several attempts, all subsequent efforts to contact the militants though the cell phone and determine a ransom amount were unsuccessful, according to Romany Nageh, Ebeid’s brother. The last time the family heard from Ebeid was on July 10, just before he crossed into Libya. “He did call his family on that day, when he was on his way to Libya and told his family that he was on his way, and that he is going with a group and it would be safe,” Tawfik said. No information has been publically available about the other two Christians taken captive. Untrue and often contradictory reporting in Egyptian media about Ebeid’s condition has exacerbated the family’s dread, Tawfik said. Several times in the past few days, some news outlets reported that a ransom amount had been set for Ebeid’s release, while others simultaneously stated that he had been killed. Family members said they have now turned to God, hoping that somehow against the multitude of conflicting reports, Ebeid is still alive and will survive the ordeal. “We put the whole situation in front of God, and after Him the authorities, the ministry of foreign affairs, and those who are in power,” Ebeid’s brother said. In addition to its sheer brutality, IS has become known for kidnapping Christians and then killing them in graphic videos. In February, an IS group in Libya released a video in which they beheaded 20 Egyptian Christians and one Christian from Ghana. All the men had been kidnapped at gunpoint in Sirte a little more than a month prior to the release of the video. Two months later, in April, IS released another video in which they killed approximately 30 Christians, all of them thought to be from Ethiopia. All were thought to be migrant workers. Keeping this in mind, Tawfik said, going to Libya for work might seem to be a quest for the insane. But for many people in Egypt and in Ebeid’s village, crushed by unrelenting poverty, the pull of any job is just too strong. For Ebeid – impoverished, uneducated, unemployed and engaged to be married for more than a year – there were three choices, his family said: Go to Libya, starve or become a thief. He took a chance trying to get to the relatively safer environs of Tripoli for better job opportunities. “His father said if it wasn’t for their extremely poor condition, his son wouldn’t have risked his life and gone. He wouldn’t have risked his life to travel,” Tawfik said. Before he visited Ebeid’s home, Tawfik said, he couldn’t understand why he would take the risk to leave.